verd de gris » Some news for January 2019! Some news for January 2019! We continue to respond to community need by extending our weekly peer support sessions here in Calderdale for local families affected by suicide bereavement. 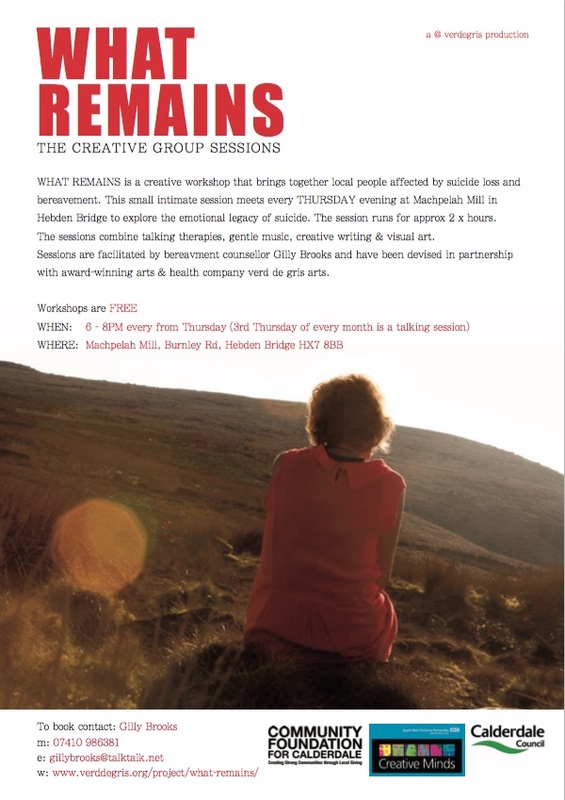 ‘What Remains’ takes place every Thursday at Machpelah Mill in Hebden Bridge. Every 3rd Thursday will be a talking session led by Gilly Brooks and local volunteers. In the Spring we will begin a similar model in Central Lancashire supported the team at Community Restart. This will include peer support work and screenings of the What Remains film in 3 locations across Lancashire, including one rural location to support farming communities affected by suicide loss. We are also meeting today with the strategic management team at South West Yorkshire NHS Foundation Trust to look at carrying this creative model through the West Yorkshire and harrogate Care Pathway. Thanks to Community Foundation for Calderdale and South West Yorkshire Partnership NHS Foundation Trust for helping to get this project developed.